On the Appalachian Trail near Sheffield, Massachusetts. Dave, Loren and I went on one of our regular hikes from Jug End to Rt. 7 on the Appalachian Trail. As we walked through a small meadow with low pine trees Loren spotted what he thought was an old wasp’s nest. 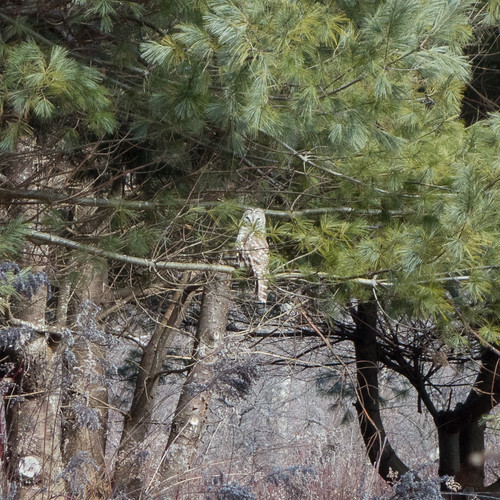 Dave took one look at it and said it was a barred owl. To my eyes it just looked like some junk hanging off a tree branch. Both Dave and I got our cameras out and zoomed in as close as we could but I knew we didn’t have the reach needed to capture the owl. So, we hiked on knowing we’d be by this spot again on our way back (this hike is a “there and back” hike). This image is heavily cropped to show the owl and I’m amazed that the RX100 captured so much detail. On our return the owl was gone from this perch but Dave spotted him on the other side of the trail higher up in another tree. I pulled out my iPhone and brought up the Audubon bird app I have and found the barred owl. There were eight sounds for this owl and I tried the first one. This owl immediately called back with the same call. We stood there for a good five minutes calling out to him with him responding. It was thrilling although no doubt we upset him. Finally he took off no doubt figuring that communicating with an iPhone just doesn’t cut it.